Sooner or later you will find yourself with an empty bottle in your hand. What next? Some apartment buildings have their very own glass recycling facilities – but most of the old houses don’t. Instead people are expected to bring empty bottles and jars etc. to glass recycling boxes and containers that are located in the street. In West Germany and West Berlin these glass recycling boxes – or “glass containers” as we call them, were first introduced in the early 80ies and are probably the first public recycling bins introduced to the German public – long before the trash bins in Berlin’s backyards began becoming so colorful. Glass, meaning mostly bottles and jars, is separately collected by the colors green, brown and white. You’ll have to decide for yourself what to do if you happen to recycle a brownish-greenish wine bottle – or a blue Gin bottle or something alike. There are some 1400-1500 spots where you can find these glass containers or glass igloos in public space. Some are located near super markets, others just randomly in some street. There is some 6000 glass Igloos all together, where you can leave your empty bottles etc. for recycling. There should be some around where you live. But of course not all glass is treated equally – not all glass is recyclable glass. That would have been too easy. As the mostly round hole suggests only empty bottles and jars should be thrown into the glass containers – all other types of glass should not be thrown into the public glass containers: broken windows, crystal glass, ceramics, bulbs, mirrors etc. are not meant to be recycled together with empty bottles. Those types of glass trash have to go either into the black or the yellow bin in your court yard – or directly to one of the recycling yards of Berlin’s trash handling service BSR. And of course you should not throw bottles into the bin that you paid deposit on. 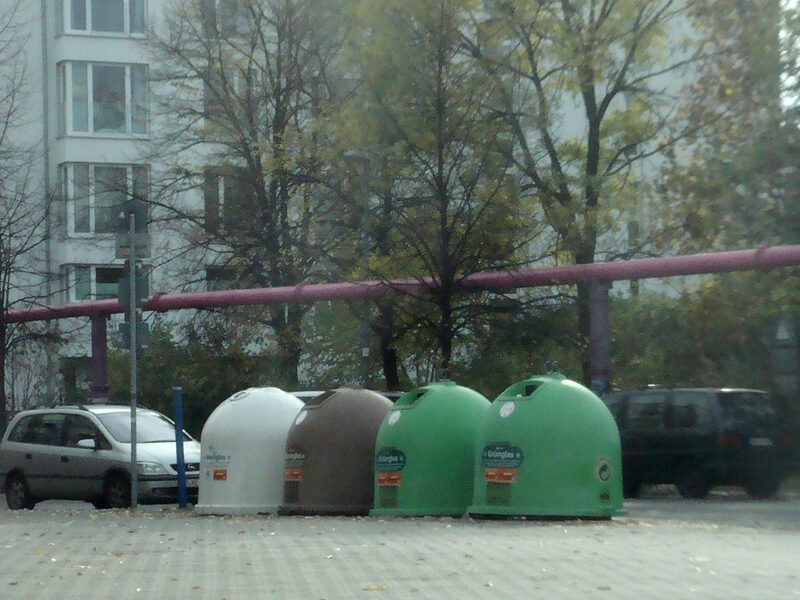 Those returnable bottles are either marked with the German word “Pfand” or “Pfandflasche”. It might be a bit confusing at first glance, but once you understand the logic (yes, there’s logic!) behind the system, you’ll know what a returnable bottle looks like – and you’ll not even have to read the small print indicating whether it’s a returnable bottle or not. The basic rule is: all drinks that have bubbles like beer and lemonade and readily mixed drinks like “vodka lemon” or “gin tonic” are sold in returnable bottles. Exceptions: water and sparkling wine. Water, sold in small bottles, is an exception because it’s water, sold in small bottles. Large water bottles however are always returnable. And sparkling wine is an exception because it counts as “wine” – and wine is never sold in returnable bottles – unless you buy directly from the wine yard. Easy, isn’t it? Great. I’ll soon add some images so that it’s easier to see the differences. Until then: don’t throw your beer bottles to the bin.